Recently, you have probably heard some buzz about how coconut oil is truly a healthy fat. You have perhaps even heard promises that it will help you lose weight, look younger, and that it may cure many of your diseases and health ailments. You have also heard the opposite view that it is really not that great, and you shouldn’t be eating it. What is the coconut oil’s true story? To start you should understand a little bit about what a fatty acid is. So bear with me for a short chemistry lesson. Trust me, you can understand this much better when you know some basics. Each fatty acid is made of a carboxylic acid group and a long hydrocarbon chain. This long hydrocarbon chain is the basis for distinguishing saturated fatty acids as medium chain fatty acids (MCFA) or long chain fatty acids (LCFA). There are short chain fatty acids also, but for this article’s purpose we will include those when we discuss MCFA’s. The hydrocarbon chains range from 2 to 26 carbon atoms in length. LCFA are 13-26 carbons, and MCFA are 6-12 carbons long. The most common MCFA is lauric acid (dodecanoic acid) with 12 carbons. Some common examples of LCFA’s include palmitic acid (16 carbons) and stearic acid (18 carbons). A triglyceride is a little different than a fatty acid. A triglyceride CONTAINS 3 fatty acids that are all attached to a glycerol backbone. Some articles use these terms interchangeably, but they are slightly different. A medium chain triglyceride (MCT) and a long chain triglyceride (LCT) are referred to in some of the research that was looked at here. When we talk about MCFA and LCFA we are talking about saturated fatty acids (SFA). These have commonly been known as “the bad fats”. The MyPlate website describes saturated fats as a building made of solid bricks, tightly packed together and solid at room temperature.12 These saturated fats are found in meats, poultry, butter, and coconut oils. The SFA are those that contain NO double bonds. Unsaturated fatty acids are typically 16-24 carbons in length, but contain at least one double bond in their structure. The MONOunsaturated fats (MUFAs) have one double bond. The POLYunsaturated fats (PUFAs) have multiple double bonds. The location of this double bond is how we typically name these unsaturated fats. For example, the omega-3 fatty acid means there are multiple double bonds and the last double bond occurs at the 3rd carbon from the end, hence the name omega-3. The unsaturated bonds in the mono and polyunsaturated fatty acids allow it to move and bend, and therefore, these fats are liquid at room temperature. These are commonly known as the “good fats”. 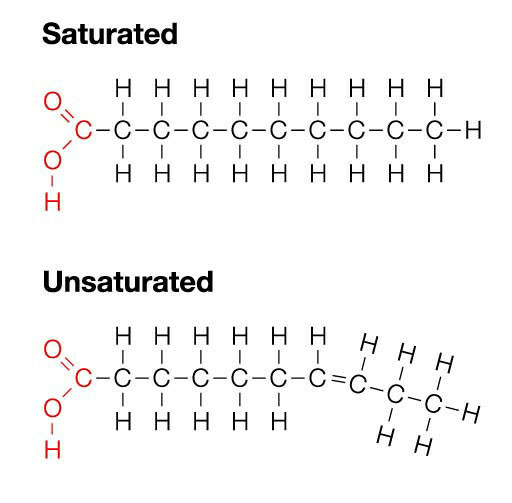 The diagram below shows an example of a saturated fat and a monounsaturated fat. Unsaturated fats typically comes from plant sources such as olives, nuts, or seeds, but unsaturated fat is also present in fish. With all of this conflicting information, how are we supposed to make an informed decision about which one is right? Who do we trust? Who do we listen to for advice? Let’s take a look at some actual research to see what coconut oil’s true story is. The research is pretty clear on this comparison. Remember these are two types of Saturated Fatty Acids that are being debated here. When looking at LCFA (remember these are from animal fats like beef, pork, and chicken), MCFA (from coconut oil and dairy fats) are for sure healthier. There are some individual studies show this quite clearly. 7,8,16,17,20 There are also some well-done review articles and meta-analyses that show this theory to be true also. A review from 2006 showed some promising benefits of MCFA when it comes to weight control, but varying results when looking at blood cholesterol and triglyceride response from increase intake of MCFA.4 The American Journal of Clinical Nutrition published a review in 2002 that discussed various research looking at MCT’s and energy expenditure (amount of Calories burned). This review concluded that there is a slight increase in energy expenditure when MCT’s are included in the diet, but cautioned that the research studies reviewed were very short in duration ranging from one meal to a couple of days. It also looked at fat deposition, or where fat is stored on the body, but the results are so varied between studies, they concluded there must not be much relationship. Lastly, the review looked into the “fullness factor” also, and again found varying results among the small research articles published. Therefore, there was no conclusion reached about fat deposition or fullness from MCT. Overall, the review concluded, “Therefore, greater energy expenditure and lower food intake with MCT compared with LCT suggest that replacing dietary LCT with MCT could facilitate weight maintenance in humans.”5 Translation: REPLACING LCFA with MCFA may increase Calories burned and help you lose a very small amount of weight. Replacing LCFA with MCFA will likely not have an effect on where you store fat or how full you are after your meal. Another review (2006) cautioned the use of excess MCT. It showed that MCTs have some promising benefits when it comes to weight control, but varying results when looking at blood cholesterol and triglyceride response from increase intake of MCTs.4 This shows that increased intake of MCTs could potentially be dangerous for people with high cholesterol, or those with a family history of heart disease. The explanation for the difference between the effects on weight loss when you replace LCFA with MCFA probably comes from the simple explanation of how they are digested and absorbed. 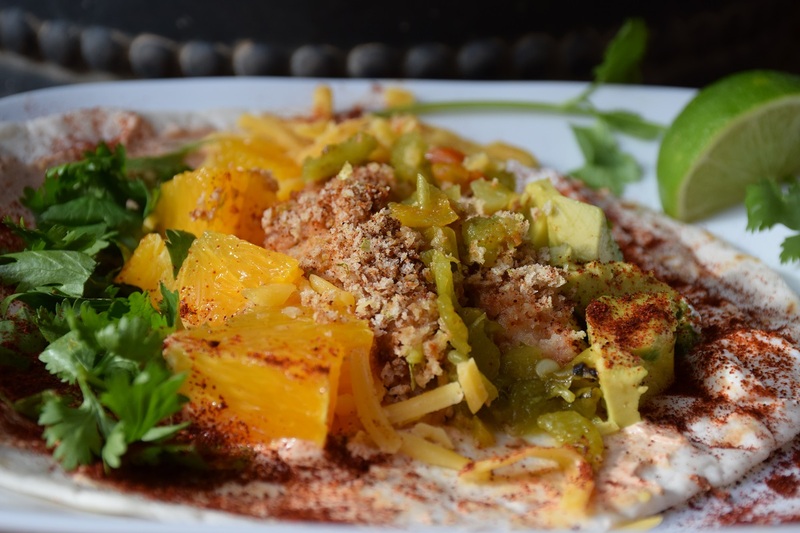 Science has shown that MCFAs are absorbed directly into the portal vein (the one that goes to the liver), transported rapidly to the liver for beta-oxidation, and therefore, you burn more Calories. In contrast, LCFAs are absorbed in the intestines and transported by chylomicrons through the thoracic duct into the systemic circulation.10, 19 This explains the WHY behind why the MCFA are a healthier alternative to the other animal fats. What we see so far is that the Unsaturated Fatty Acids (MUFA and PUFA) are probably slightly better compared to coconut oil in terms of Calories burned, LDL (the bad cholesterol), and effects on total body cholesterol. To look at what oils have MUFA and PUFA (the unsaturated fats) see the chart above. However, the MCFA in coconut oil may help to increase HDL (the good cholesterol) levels. 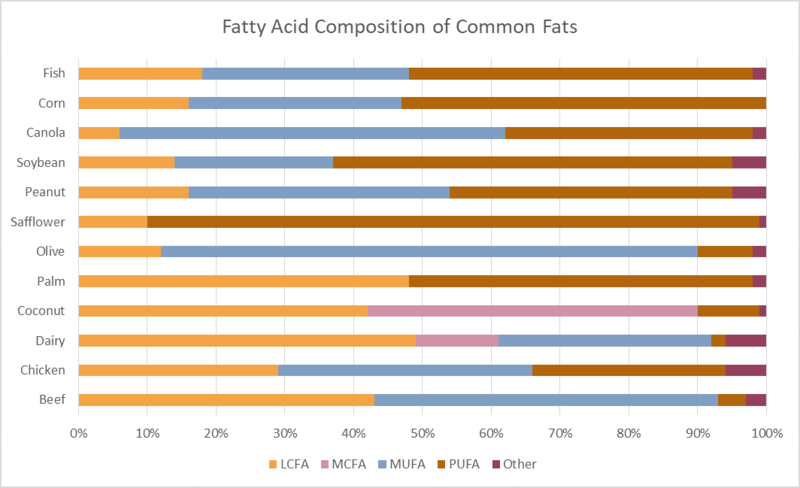 At this point, since there hasn’t been A LOT of research comparing unsaturated fats to MCFA, we must be careful in how we interpret this data. Preliminary results maintain the concept that the unsaturated fats are still probably BETTER than the MCFA. Coconut oil does have some cooking benefits because it has a higher smoke point, it doesn’t go bad as quickly as some other fats, and it can be used in cooking and baking since it is solid at room temperature. In addition, coconut oil has a desirable taste for many people. Lastly, since coconut oil has a much higher percentage of MCFA than butter, it may be a slightly better choice than butter. To conclude, I think we need to reconsider the terms “good fats” and “bad fats”. There is obviously a lot more to this story than good or bad. There appears to be more of a continuum. This continuum places the unsaturated fats (MUFA and PUFA), olive oils and other vegetable based oils, as probably the BEST choices. The MCFA in coconut oil appears to be running in second. Since the MCFA is a lower percentage in butter, it is coming in at third place. Lastly, the hard animal fats from beef and pork seem to holding up the rear. New research is being done, and as we learn more about nutrition and our bodies, the race could potentially change. Next time you see THE NEXT MIRACLE FOOD, don’t jump on the band wagon so quickly. Think about it, and find a trusted source for good information. As always with nutrition, moderation is EVERYTHING. Please enjoy a steak occasionally. If you can REPLACE your beef and pork with coconut or dairy fat, it is pretty obvious that is a better choice. Unsaturated oils are probably still the best, and the majority of your fats should come from nuts, avocados, and other vegetable oils. My last thought: don’t forget that fats are the highest Calorie foods! Enjoy them in moderation. Some is good for us, but as with most good things, there can always be too much of a good thing! Or…too little of a good thing for that matter. 1. Twenty-four-hour energy expenditure and urinary catecholamines of humans consuming low-to-moderate amounts of medium-chain triglycerides: a dose-response study in a human respiratory chamber. Dulloo AG, Fathi M, Mensi N, Girardier L. Eur J Clin Nutr. 1996 Mar;50(3):152-8. 2. Surprising Health Benefits of Coconut Oil. Dr. Oz. http://www.doctoroz.com/article/surprising-health-benefits-coconut-oil. Accessed June 2017. 4. Medium-chain triglycerides. Berit Marten.Maria Pfeuffer. Jürgen Schrezenmeir. International Dairy Journal. Volume 16, Issue 11, November 2006, Pages 1374-1382.
vol. 132 no. 3 329-332. 6. Weight-loss diet that includes consumption of medium-chain triacylglycerol oil leads to a greater rate of weight and fat mass loss than does olive oil. Marie-Pierre St-Onge and Aubrey Bosarge. Am J Clin Nutr March 2008. vol. 87 no. 3 621-626. 7. Medium- versus long-chain triglycerides for 27 days increases fat oxidation and energy expenditure without resulting in changes in body composition in overweight women. St-Onge MP, Bourque C, Jones PJ, Ross R, Parsons WE. Int J Obes Relat Metab Disord 2003;27:95–102. 8. The influence of the type of dietary fat on postprandial fat oxidation rates: monounsaturated (olive oil) vs saturated fat (cream). Piers LS, Walker KZ, Stoney RM, Soares MJ, O’Dea K. Int J Obes Relat Metab Disord 2002;26:814. 9. Monounsaturated fat-rich diet prevents central body fat distribution and decreases postprandial adiponectin expression induced by a carbohydrate-rich diet in insulin-resistant subjects. Paniagua JA, Gallego de la Sacristana A, Romero I, et al. Diabetes Care 2007;30:1717–23. 10. The application of medium-chain fatty acids: edible oil with a suppressing effect on body fat accumulation. Takeuchi H1, Sekine S, Kojima K, Aoyama T. Asia Pac J Clin Nutr. 2008;17 Suppl 1:320-3. 11. Effects of Medium-Chain Triglycerides on Weight Loss and Body Composition: A Meta-Analysis of Randomized Controlled Trials. Karen Mumme, Welma Stonehouse, PhD. J of the Academy of Nutrition and Dietetics. Feb 2015 Vol 115(2): 249–263. 14. Coconut oil isn’t healthy. It’s never been healthy. USA Today Network, Ashley May. USA TODAY Published 11:40 a.m. ET June 16, 2017. 16. Effects of Dietary Coconut Oil on the Biochemical and Anthropometric Proﬁles of Women Presenting Abdominal Obesity. Monica L. Assunca et al. Lipids (2009) 44:593–601. 18. The influence of the type of dietary fat on postprandial fat oxidation rates: monounsaturated (olive oil) vs saturated fat (cream). L S Piers et al. Int J Obesity. June 2002, Vol 26 (6):814-821. 19. Review: Medium Chain Triglycerides. Beret Martin, et al. Inter Dairy J. 2006, 16:1374-1382. 20. Effects of coconut oil, butter, and safflower oil on lipids and lipoproteins in persons with moderately elevated cholesterol levels. Cox, C. et al. J Lipid R. (1995) Vol 36:1787-1795. 21. Effects of fats and fatty acids on blood lipids in humans: an overview. M B Katan, et al. Am J Clin Nutr. December 1994 vol. 60 no. 6 1017S-1022S. Do you have a nutrition question? Ask me, and I will find it out for you!